The 2005 iBooks are also slightly faster than the models they replace, now have a 1.5 GB RAM ceiling, and the SuperDrive on the 14″ model is faster. The 14″ Combo drive model has been discontinued, although you can order a build-to-order model that way and save US$100. Unchanged are the size, weight, battery life, amount of video RAM, and screen – although the rumor sites have been rampant with speculation of a widescreen iBook. The new 12″ iBook retails for the same US$999 as the model it replaces. The 11% speed boost is nothing to get excited about, but the fact that the iBook finally ships with 512 MB of RAM is. That’s enough to get really decent OS X performance, much better than you’d get with a 256 MB machine. (Adding 256 MB of RAM to older iBooks costs US$30 and up.) The new 12″ model also includes a 40 GB hard drive, 10 GB more than the 1.2 GHz model had. I can’t see too many users getting excited about sudden motion sensors, but the scrolling trackpad, improved Radeon graphics, and inclusion of Bluetooth as a standard feature should make the iBook more attractive to most users. The 1.2 GHz model that the 1.33 GHz model supersedes is being closed out at a $100 discount, which makes the MHz/dollar virtually identical. Where the new iBook wins is the extras – more RAM, a 1.5 MB RAM ceiling, improved graphics, and so forth. Unless your budget is really tight, the new 12″ model is the better buy. The real value challenge, as always, is in refurbished iBooks. The Apple Store has refurbished 12″ 1.2 GHz iBook G4s available for US$849. Looking at the difference in features, I’d call the refurbished 1.2 GHz model nearly equal in value to the new 1.33 GHz one. The new 14″ iBook retails for US$1,299 – $200 less than the previous 14″ SuperDrive iBook and the same price as the 1.33 GHz Combo drive model. Hardware improvments are essentially the same as on the 12″ model, and the SuperDrive is now an 8x model (vs. 4x in last years 14″ iBook G4). The 9% difference in CPU speed is not a compelling reason to look at the new models, but the price and new hardware are. 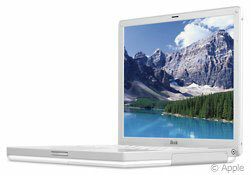 Close-out prices put the 14″ 1.33 GHz iBook G4 as low as US$994 with a Combo drive, US$1,144 with a SuperDrive. At US$300 less than the new 1.42 GHz iBook, the Combo drive model is a good value for those who don’t need to burn DVDs. Even after boosting RAM by 512 MB, that’s an extra US$240 in your pocket. The 1.33 GHz SuperDrive model is less compelling. The US$150 difference in CPU speed and RAM offsets any difference in price, and the new features (faster SuperDrive, Bluetooth 2.0, improved graphics, etc.) make the new model the better buy. Apple hasn’t yet adjusted pricing of refurbished 14″ 1.33 GHz iBooks. When they do so, they may become competitive with the new 14″ 1.42 GHz model. The new iBooks incorporate the scrolling trackpad, sudden motion sensor, and integrated Bluetooth already available in the PowerBook G4. Looking at the increased RAM, improved graphics, and step forward in CPU speed, the 2005 iBooks offer Apple’s best value yet.